^ Douglas Alton Smith. A History of the Lute from Antiquity to the Renaissance. p. 9. Lute Society of America (LSA), 2002. ISBN 0-9714071-0-X. ^ MITRA JAHANDIDEH, SHAHAB KHAEFI, AHANALI JAHANDIDEH, MASOUD KHAEFI, “Using the Root Proportion to Design an Oud”, Department of Music, Faculty of Fine Art, Tehran University, Tehran, IRAN, http://www.wseas.us/e-library/conferences/2010/Iasi/AMTA/AMTA-05.pdf. ^ Fuad Köprülü, Türk Edebiyatında İlk Mutasavvıflar (First Sufis in Turkish Literature), Ankara University Press, Ankara 1966, pp. 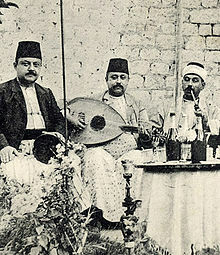 207, 209.; Gazimihal; Mahmud Ragıb, Ülkelerde Kopuz ve Tezeneli Sazlarımız, Ankara University Press, Ankara 1975, p. 64.; Musiki Sözlüğü (Dictionary of Music), M.E.B. İstanbul 1961, pp. 138, 259, 260.; Curt Sachs, The History of Musical Instruments, New York 1940, p. 252.